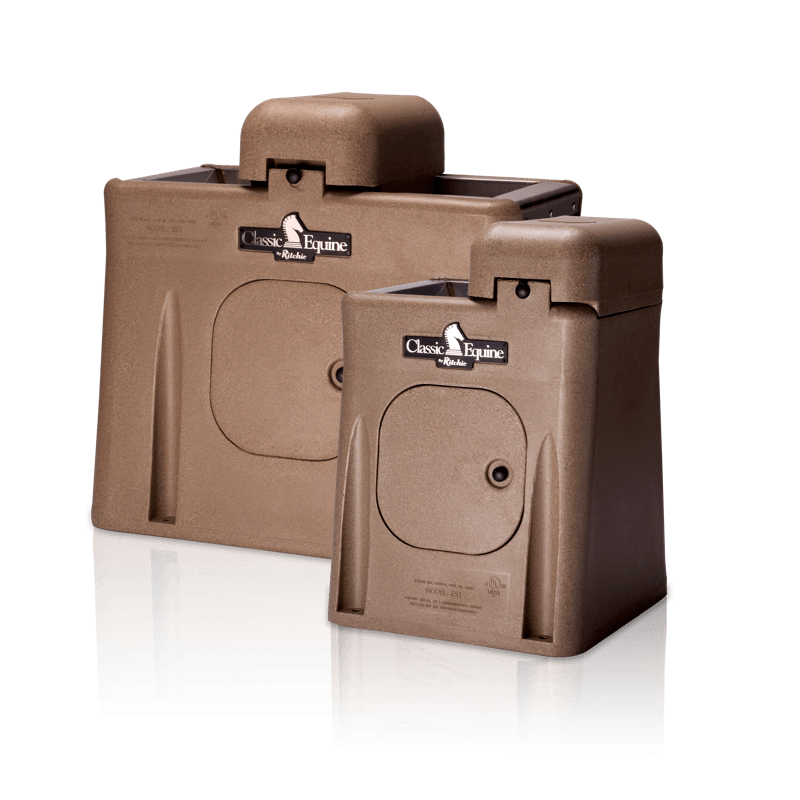 Find The Right Automatic Waterer For You. Classic Equine By Ritchie offers 4 families of waterers ranging from single stall units up to 40 head units with heated and non-heated options. With our worry-free float system your horse never has to wait for water. Easy to setup, easy to use, easy to maintain. Your time spent watering horses and cleaning troughs decreases dramatically. Your automatic watering saves money and waters your horses at a fraction of the cost. Classic Equine By Ritchie automatic waterers help keep horses healthy by keeping them fully hydrated, regardless of climate. Fully hydrated horses perform better, have higher feed efficiency, and are less prone to colic. Our easy to clean units provide a constant flow of fresh water with fewer contaminants, encouraging your horses to drink more. 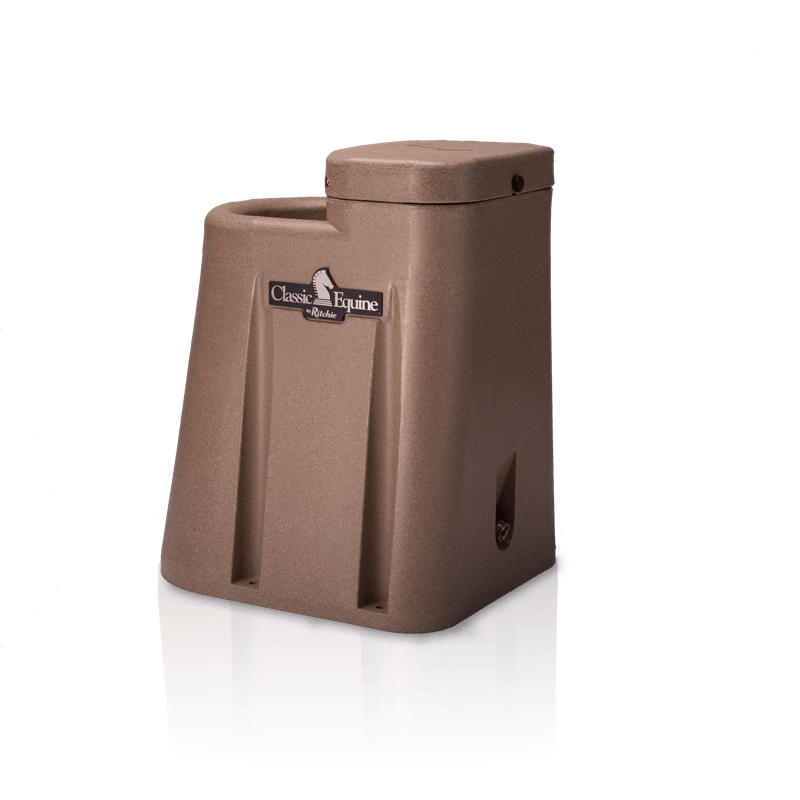 Our waterers come in an attractive granite finish made from rotomolded polymer that is extremely strong, insulative, and lasts for years. Our heated ULTRAFOUNT and STALLFOUNT feature Stainless Steel troughs that won’t rust. Smooth edges, rounded corners, and tamper resistant lids provide utmost safety for your horses. Our variety of portable and permanent units provide the best solution available for any climate. Classic Equine By Ritchie Waterers help promote good stewardship of the land and resources. The small footprint takes up very little space, yet delivers big advantages while conserving nature’s most precious resource. Smooth, easy cleaning surface reduces the use of chemicals that are harmful to you, your horse, and the environment. Reduced run-off and evaperation saves water use and expense. Classic Equine by Ritchie Waterers have been so dependable and user friendly! I especially enjoyed not having to break ice this past winter! They are awesome! 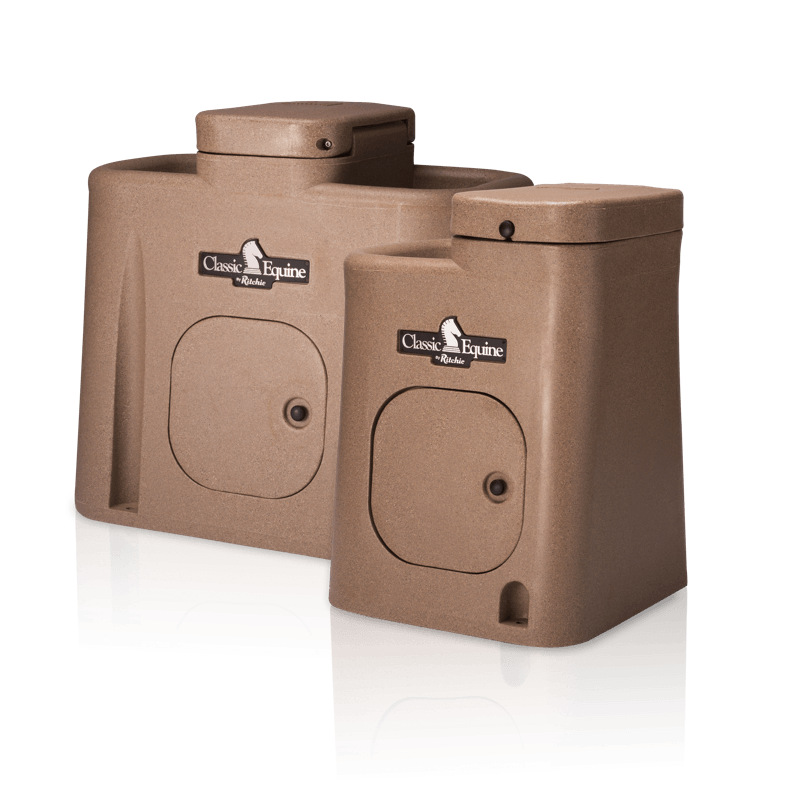 Classic Equine by Ritchie automatic waterers save me man hours daily by reducing feed time due to not having to clean water tubs and refill. This saving will definitely off -set the cost of the waterers over time, they have been a great investment for the quality of the water provided to my customers horses and the efficiency of our day to day care! Classic Equine By Ritchie offers three options to keep your horses hydrated with fresh, clean, temperate water in the harshest winter conditions. 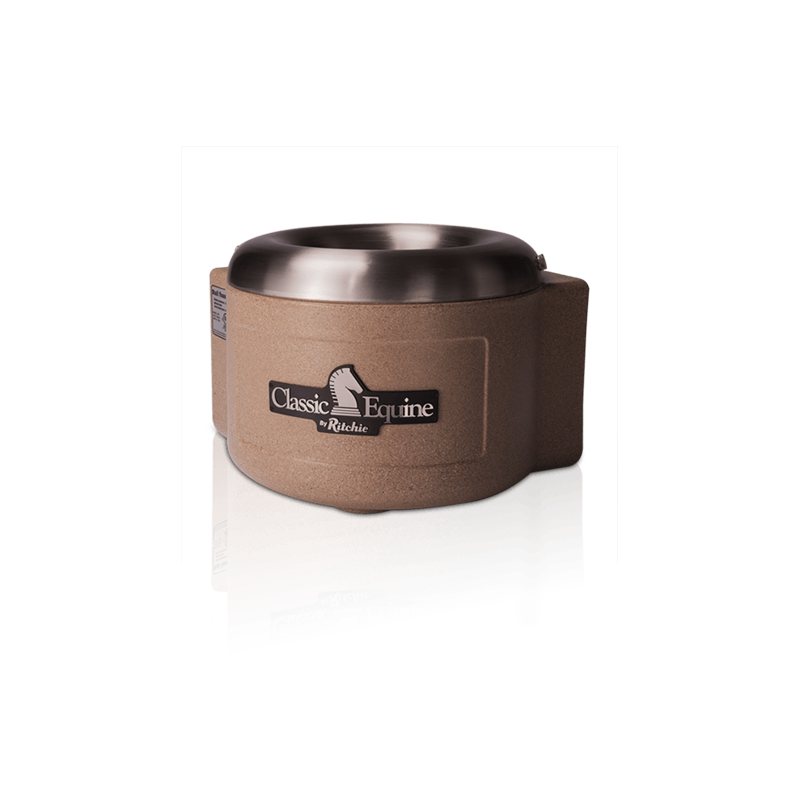 Make breaking ice a thing of the past with Classic Equine By Ritchie Heated waterers. Self-regulated heat available in the STALLFOUNT.